After the success of the City of Cambridge Brass Band's Big Brass Play Day last which saw almost 100 young brass and percussion players come together to rehearse and perform specially-commissioned brass band orchestrations of three BBC Ten Pieces arrangements, we are pleased to announce that we shall be holding a similar day on Sunday 4th March at Impington Village College, the City of Cambridge Brass Band's Big Brass Jazz Day where we shall be playing brass band arrangements of jazz and big band classics! 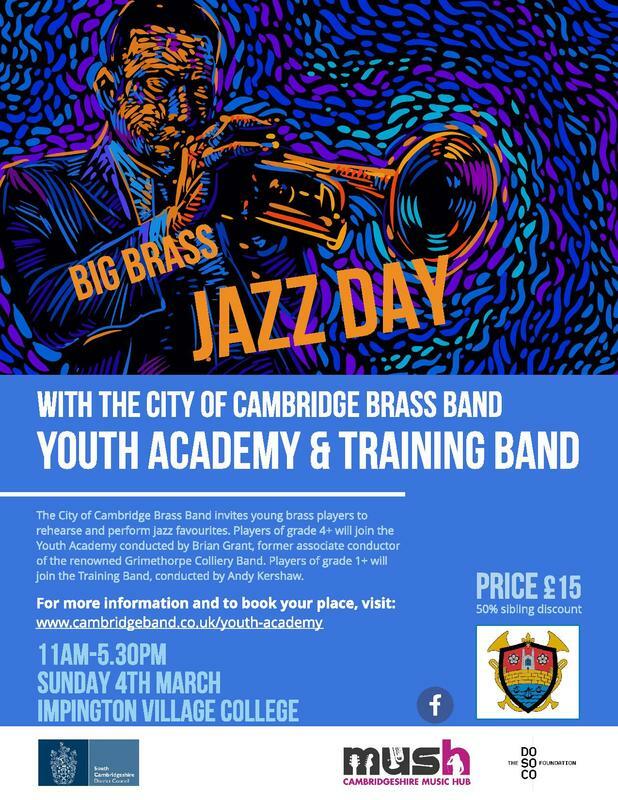 Players of grade 4+ standard are invited to rehearse and perform with the City of Cambridge Brass Band Youth Academy who will be conducted by Brian Grant, former associate conductor of Grimethorpe Colliery Band. Players of grade 1+ standard are invited to rehearse and perform with the City of Cambridge Brass Band Training Band conducted by eminent brass band conductor Andy Kershaw. The day's whole-band and sectional rehearsals will culminate in an informal (free!) performance in IVC's Gropius Hall at 5pm where both bands will perform the pieces they have been preparing throughout the day. Several youngsters missed out last year as places are limited. To avoid disappointment you can book your place now by completing the online form.